Having a steady supply of blueberries on hand is a great way to add a little sweetness (and some vitamins and minerals) to your breakfast or favorite smoothie. Blueberries are also a tasty snack all on their own. Unfortunately, blueberries can be a bit expensive. But if you grow your own blueberries at home, you can skip the inflated prices and enjoy fresh fruit from your own garden. 1. Picky, picky, picky: Before planting your blueberry bush, do a little research and make sure you snag a bush that will grow best in your climate. Some berries do better in humid climates, while other varieties do just fine in freezing temperature, according to One Green Planet. 2. Consider the soil: Acidity matters. The Almanac recommends a soil pH of between 4 and 5. (Here's a quick way to check your soil acidity.) If your soil and/or weather conditions aren't ideal for berry growing, you can plant them in pots. 3. Plant them right: Your berries need plenty of sunlight and good soil. If you are planting them in the ground, choose a spot that gets a lot of sunlight. Leave at least 5 feet between each bush, according to HGTV. If you opt for pot-planting, choose an 18-inch pot. Give them about 1 to 2 inches of water per week. 4. Keep them safe: Protect your plant from bugs, birds and other hungry creatures by framing it with bamboo sticks and covering with a food-grade net, HGTV recommends. 5. Keep 'em coming: Blueberry bushes can produce fruit for up to 20 years, according to the Almanac. To ensure longevity, prune your bushes every few years. Because pruned bushes won't produce the year they are pruned, you may want to have more than one bush and alternate pruning seasons. 6. Get the best: Buds typically appear in the early spring, and berries are usually ready to pick by July. After they turn blue, wait a few days. Ripe berries will fall off the bush into your hands. 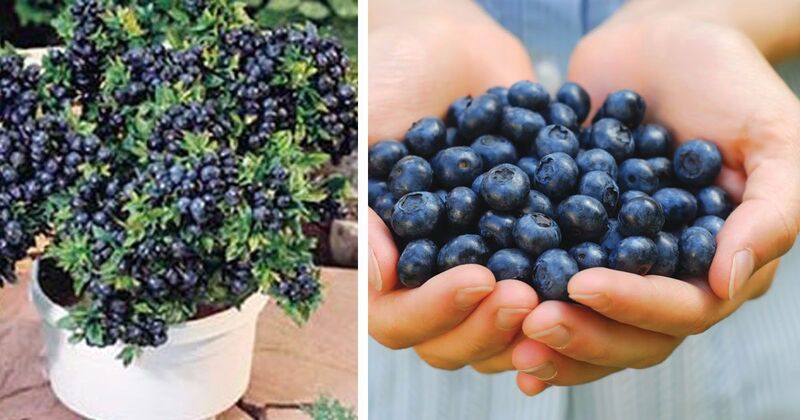 Growing blueberries is a great way to create your own patio or balcony garden if you live in a small place. If you know friends who'd love to have their own supply of blueberries, share these tips with them on Facebook.